If high blood sugar is something you struggle with, chances are you've been overwhelmed by the wealth of well-meaning information you've heard from doctors, nutritionists, and other sources. Isn't it time to put the theories to the test and determine once and for all how to get your numbers back to normal? That's exactly what bestselling author Dennis Pollock did. And the results of well over 100 blood sugar tests he conducted for this book, further backed by brand-new research and real-life stories, will give you the answers you've been searching for. In addition, you'll learn why, how, and when to test, the importance of reading food labels, helpful guidelines for weight control and general nutrition, and so much more. For the first time in your diabetic journey, you will finally be able to experience what it feels like to know that maintaining normal blood sugar isn't just possible, it's entirely achievable. 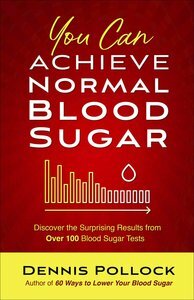 About "You Can Achieve Normal Blood Sugar: Discover the Surprising Results From Over 100 Blood Sugar Tests"
Dennis Pollock is a pastor, the author of Making Room for Jesus, and the former co-host of the Christ in Prophecy broadcast. As the founder of Spirit of Grace Ministries, he regularly leads conferences on Bible prophecy and spiritual renewal, along with mission outreaches around the globe. After creating a successful program to normalize his blood sugar, Dennis has also become an advocate for better, more abundant health.